Hey all you people who just finished marching this summer! We're running out of Forzato pics! Hurry up and e-mail your best shots from the summer to dave@dci.org along with where and when the photo was taken. Send some biographical information about yourself as well. We'll give you full credit. Also, let us know if you want your e-mail address included. Emily Abramson and Jackie Watson are good friends from Cordova, Tenn., who met volunteering for their children's high school band. Jackie sent in this one. 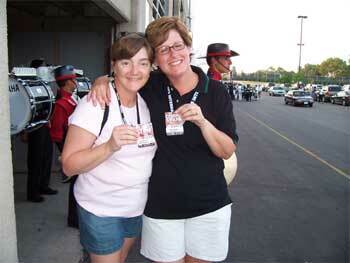 "We both were able to spend the first 10 days of the 2005 season working for the cook crews for our kids' drum corps. Emily's daughter Sara is a member of Phantom Regiment's color guard, and Jackie's two sons, Joseph and Christopher, are Madison Scouts. "Whenever our corps were at the same shows, we met up in the stadium to watch the performances, swap cook stories, and talk about how exhausted we were and how much fun we were having. This photo shows us on June 23 in Cedar Rapids, Iowa, showing off our staff passes. "Our families were in Foxboro together cheering on our two favorite corps!" Thanks Jackie!